These are the words that try men’s (and women’s) souls. 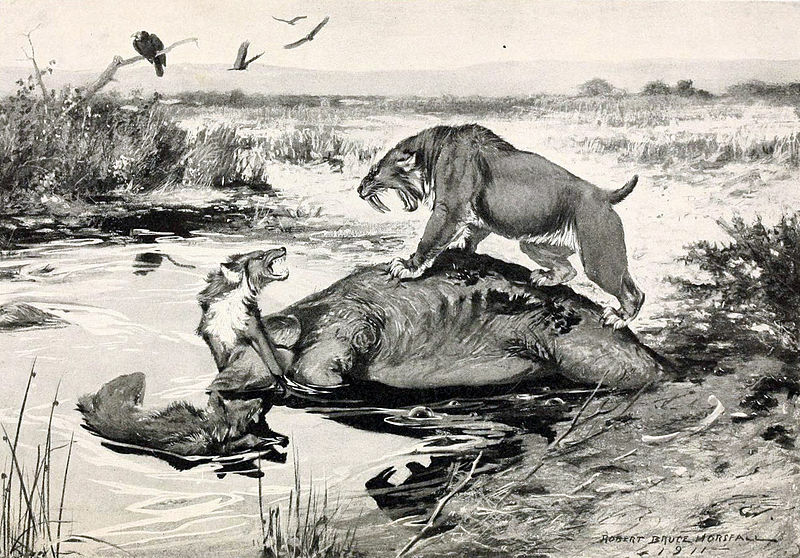 A Smilodon and Canis dirus debate proper word usage. Lexicide has covered decimate (somewhat). Others, such as the war between less than and fewer than, we don’t intend to tackle; writers have spilled much ink on that particular distinction. We also try to stay away from tautologies (phrases that repeat themselves or use self-evident descriptors) like safe haven, frozen tundra (suggested by Andrew from Pennsylvania) and my personal favorite, salsa sauce. Picking on salsa sauce may be mildly unfair (see what I did there?) to the Spanish-illiterate, just as most Anglophones won’t see the error in please R.S.V.P. 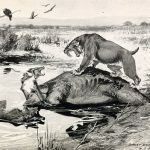 Scott from L.A. went further and panned La Brea Tar Pits, as la brea is Spanish for “the tar.” Which means The La Brea Tar Pits translates as “the the tar tar pits.” Ay, carumba. Scott in Los Angeles also asked: How about “free reign”? Lexicide has covered a few homonyms, but as a rule (I did it again! ), we don’t touch them. In case you don’t know, you give someone free rein, just as you rein a person in — rein as in those straps of leather you use to steer or stop a horse. If you type free reign and then justify it by claiming your giving someone the powers of a monarch, you are wrong. Just wrong. Claire in in Delaware suggested synergy, which I’m not sure actually had a meaning to begin with. Andrew also suggested notorious, which many use to mean well-known (with no negative connotation) as opposed to infamous. I seem to recall hearing colleagues misuse notorious that way, but a search of news sites comes up snake eyes. We’ll keep an eye on this one, though, as it would follow the pattern of negative words shifting into neutral (see fulsome, postmortem and stagnant). Lylah from Boston went on to criticize meteoric rise when, in fact, meteors only fall. Speaking of falling, Elisa from Virginia hates fail as a noun. Sorry, Elisa. I think that one is here to stay. Anne, an English teacher in North Carolina (wouldn’t you know it? ), does not like the conflation betwixt everyday and every day. Finally, Andy from Florida, disses newly created words without vowels like “pwn.” Obviously, Andy, you’re not a fan of the Czech language. This entry was posted in commentary, sightings, words on September 27, 2013 by mark.